Mothers is good, but there is better! Welcome to Mothers clay bar review! Mothers car care products are synonymous with cosmetic car care and are actually the very first products I used on my cars as a teenager. This Mothers cal y bar review will be based on a "tool" most often called detailing clay that didn't even exist when I first got started with my own cars, nor did it exist when I started my professional detailing business. We have come a long way with what is also known as surface paint care due to advances in chemical engineering. But surprisingly, most people I talk to know very little about detailing clay in general, never mind the version put out by Mothers with their clay bar kit. The overall Mothers detailing clay review. Does Mothers clay bar stack up against the competition? Professional alternatives to Mothers clay bar. Generally come in Clay Bar Kit only; this is a good thing as you get multiple products in order to complete the task. Mothers provides (2) smaller clay bars instead of a single and larger piece of detailing clay. Yellow clay bars are mild versions and will perform for most levels of fall-out except for excessively heavy cases. If you are a committed Mothers fan, then you don't need to overthink this moment and their version of detailing clay. As I said above, it will perform for any driveway detailer and car owner. It would be hard to tell the difference in the many clay bars available on the market today if you were blind folded and asked to use one. One of the big differences is simply the size of the bars. Since I have never used one of these long term professionally, my only concern would be their ability to hold up to day to day use in the professional world. But for any enthusiast or driveway detailer; this becomes a non-issue as you will only be using it every so often. This could be as often as every 3 months, to as little as every couple of years. Wash car to remove traditional surface dirt. 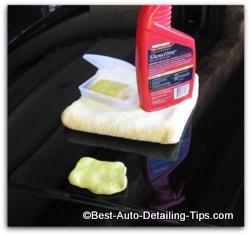 Use detailing clay/clay bar to remove embedded contaminants from your car paint. Considered to be retail grade like the Mothers from above. Will perform for anyone who is a driveway detailer, enthusiast, or simply looking to take care of their own car. Comes with 2 individual clay bars. Considered as enthusiast to professional grade. I am a big fan of Chemical Guy's products as a rule. Griot's has a stellar reputation among enthusiasts/professionals at all levels. One of my favorite companies producing some of the best products and tools. Mothers clay bar and Meguiar's clay bar(s) will perform for virtually any person working on their own cars. Every car that spends any amount of time exposed to the out-doors will eventually need to be clayed. Even that brand new car of yours will need to be clayed (at least 99% of the time). If you take the time to read the descriptions of the different clay bar kits on Amazon, you will notice there seems to be contradictions between companies. Like every other area of life; the world of cosmetic car care has its own level of hyped-up marketing and advertising. You don't need to overthink choosing the "right" clay bar, or the "best" clay bar. If you came here looking for the Mothers clay bar the simple answer is that you will be just fine. Any of these clay bars will perform and it becomes more about the user experience. Unless you are on a really tight budget, then I would go with the either of the Chemical Guy's clay bar kit or the Griot's Garage. For the extra bucks, you will have a better experience. I hope the Mothers clay bar review will help you take at least one step forward to getting the results you are after!